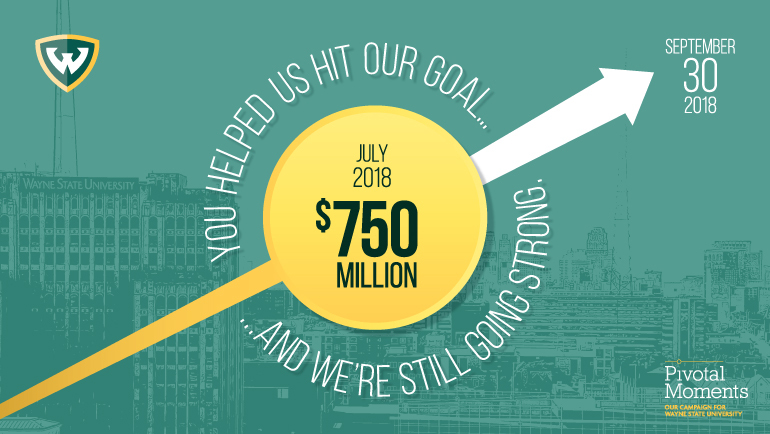 Wayne State University has successfully reached the $750 million goal for its comprehensive fundraising campaign, Pivotal Moments: Our Campaign for Wayne State University, three months early. Alumni and friends will still have time to participate as the campaign moves toward its targeted close date of September 30, 2018. Publicly launched in October 2014, Pivotal Moments is Wayne State’s most ambitious fundraising campaign, supporting students and programs throughout the university. The campaign focuses on key priorities of student success, research and faculty support, facilities and spaces, and community outreach. The primary fundraising goal involves student support. In that area, more than $125 million has been raised to create new or enhance existing scholarship funds for students. Another key goal of the campaign is for at least one-quarter of funds raised to be new gifts toward the university’s endowment. To date, the amount of new endowment commitments has exceeded the goal by five percent. An additional $23.7 million has been designated for non-endowed scholarship support. Over $90 million has been raised to support faculty members in their research and teaching, and more than $60 million has been raised to build or refurbish campus facilities. Nearly $35 million of the campaign total has come from gifts of $1,000 or less. Around 50 percent of funds that have come from individual donors are from non-alumni. To mark the end of the successful campaign, in tandem with its 150th anniversary, Wayne State will host a special on-campus celebration on Friday, October 26, 2018. $40 million from Mike and Marian Ilitch for the Mike Ilitch School of Business, the largest gift in university history; also $8.5 million for the School of Medicine to create the Ilitch Chair for Surgical Innovation in the Department of Surgery. The department was renamed the Michael and Marian Ilitch Department of Surgery.